February 2014 marked my ten-year anniversary working on the OSIRIS-REx project. At this point, we have completed most of our subsystem design reviews and are diligently preparing for the Mission Critical Design Review the first week of April. I decided to celebrate this important milestone with a look back at how the overall design of the spacecraft has changed with time. 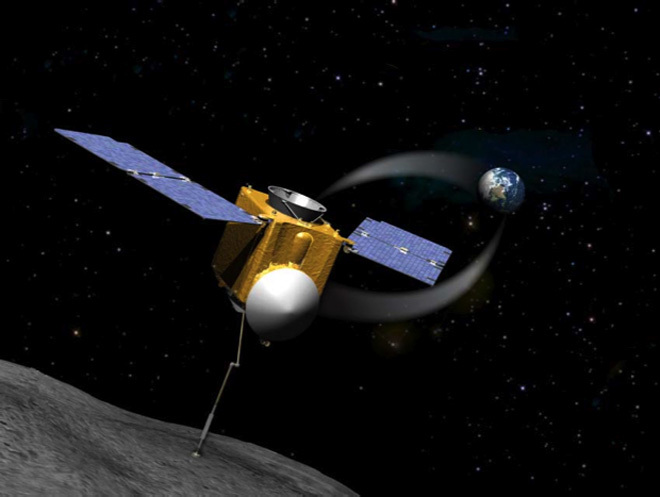 In February 2004, the University of Arizona teamed up with Lockheed Martin Space Systems to develop an Asteroid Sample Return Mission concept for the NASA Discovery Program. The team was very ambitious at this time; the initial mission design included visiting two separate asteroids, collecting a sample from each one, then returning both samples to the Earth. As you can see from the early concept drawings below, the spacecraft contained two Sample Return Capsules! OSIRIS spacecraft design circa 2004. In those days we were foolish enough to think we could sample two asteroids in one mission. A close-up view of an early OSIRIS spacecraft concept drawing – everything seemed so simple back then. One key design concept that has stuck with us for the past ten years is the decision to use the Sample Return Capsule design from the successful Stardust Comet Sample Return mission. In the early days, we took this notion to the extreme and designed the sampling mechanism to reside entirely within the capsule, basically extending the simple aerogel-collector-grid arm concept to a whopping two meters. The initial design for TAGSAM involved a complex deployment scheme from inside the sample return capsule. 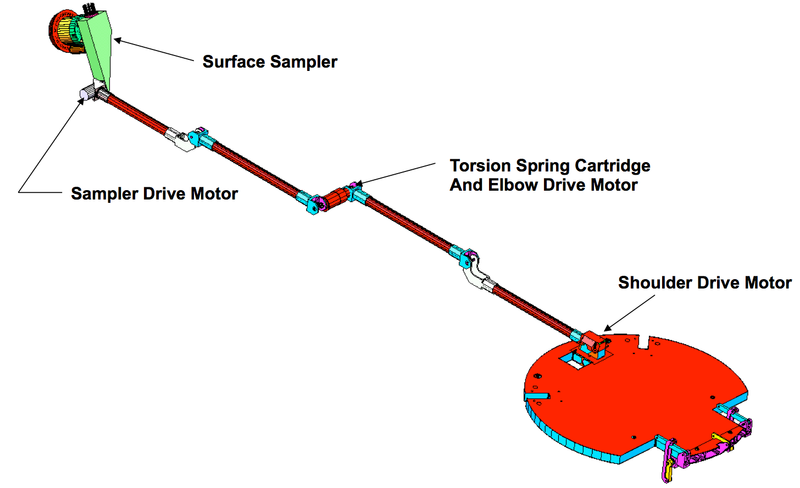 The idea was to open the capsule before approaching the asteroid surface, deploy the sampling device using five separate drive motors, contact the asteroid and collect the sample, then retract the sample head directly back in the capsule. This design had several benefits, including the ability to immediately store the sample after collection. 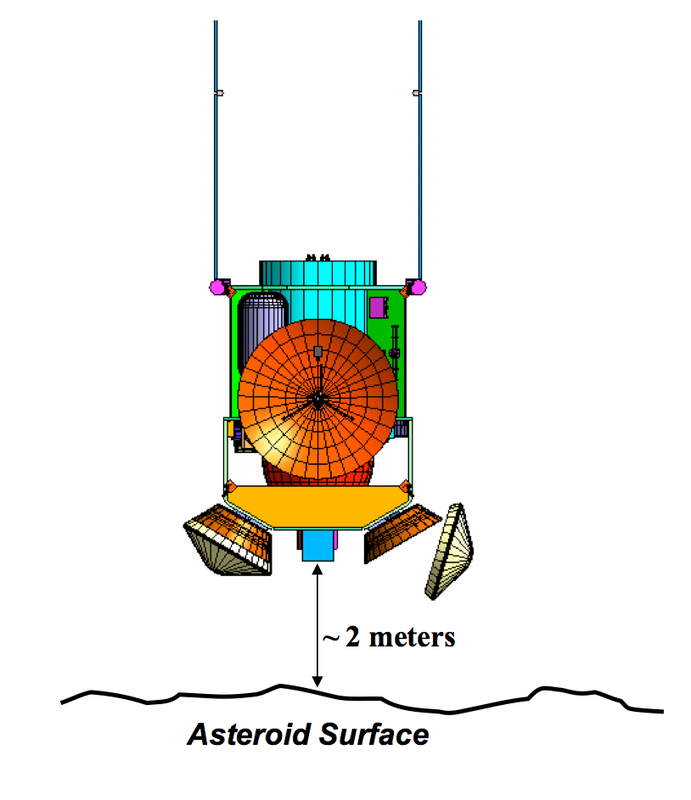 However, the technical challenges associated with packing all of that equipment into the relatively small capsule, combined with the complications associated with interacting with the asteroid surface, quickly led us to abandon the all-in-one approach, and move the TAGSAM sample arm and collector outside the spacecraft. In the original OSIRIS concept we planned to sample two asteroids before returning to Earth. We had another major design revision after we looked at the complexity of trying to visit two asteroids. We quickly decided that collecting two samples prior to delivering one back to Earth led to too much risk in losing the first sample. We then looked at trajectories that had us visiting one asteroid, dropping off the sample, visiting the second asteroid, then heading back to Earth one final time. As cost and schedule estimates started to come in, it became obvious that the two-asteroid mission was not achievable within the resources of the Discovery Program. Our first major “descope” was to remove the second asteroid from the mission profile. 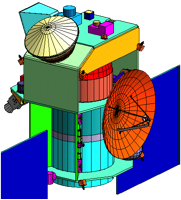 The spacecraft design changed to include only one return capsule. It is interesting to note that we did not immediately switch to the symmetric design that is critical to mission success. The remaining capsule was still located off to the side of the spacecraft. After realizing the complexity of sampling two asteroids the OSIRIS team quickly descoped the mission down to a single target. As I look back at the older spacecraft design drawings shown above, I am surprised to see that in those early days, we included two separate sets of solar arrays – similar to our current design. After we failed to win the Discovery mission in 2004 (no teams were selected that round), we regrouped for a proposal submission the following year. The spacecraft from this initial submission was featured on the cover of our proposal. For this round of design, we based our spacecraft design on the Mars Odyssey mission. One notable, short-lived feature from this era is the single, asymmetrical solar array that is characteristic of Mars Odyssey. 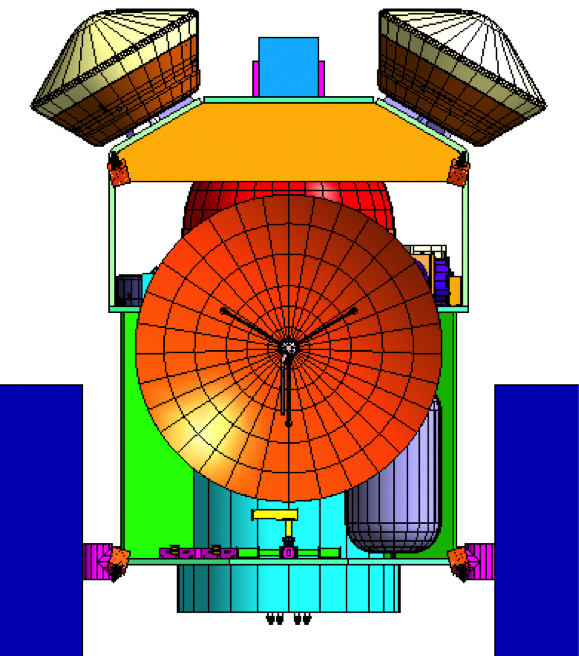 For the second round of Discovery proposal development the OSIRIS spacecraft was based on the Mars Odyssey design. The 2005 proposal was successful and we were awarded a Phase A Concept Study by NASA. We started the Concept Study by reviewing the spacecraft configuration and quickly identified the single solar array as a major design flaw. With this design, the spacecraft was unbalanced to solar radiation pressure at Bennu. Lessons learned from the NEAR mission showed us that retrograde, near-terminator orbits are the most stable in response to gravity and solar radiation pressure perturbations. As we got into detailed mission design we realized that orbiting a small body like Bennu requires minimal variation in small-body forces. To minimize these forces, we needed to balance the center of pressure and the center of gravity on the spacecraft. One key design change to accomplish this is to return to the dual solar arrays, mounted symmetric to the center of the spacecraft. Each array was sized based on the spacecraft dimensions. Our power needs mandated that we fly a total of four arrays – two on each side. 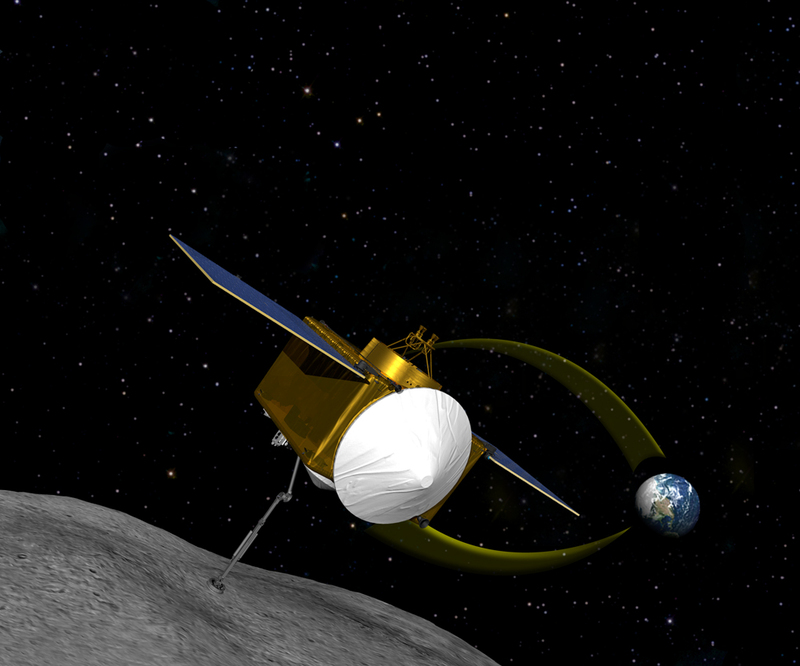 Furthermore, OSIRIS-REx must observe and interact with Bennu in many different ways. In order to keep the solar power flowing, we needed the ability to maneuver the arrays into a wide range of positions. To achieve this flexibility, we added two-axis gimbals to each panel. At the end of our Phase A Concept Study – the spacecraft configuration reflected this design change. Detailed analysis revealed the need to build a spacecraft with two symmetric sets of solar arrays. Despite glowing reviews for both our science and engineering plans, we were not selected by NASA to continue mission development beyond Phase A. Instead the GRAIL mission won this round – sending the OSIRIS-REx team back to the drawing board. Our luck changed in 2008 when Asteroid Sample Return was identified as a key mission concept for the next NASA New Frontiers mission opportunity. For this round, OSIRIS-REx grew from a Discovery-class mission (named OSIRIS) into the New Frontiers class, with a budget almost twice the size. We added the “REx” to our name to symbolize this growth. One of the first major design changes that we implemented was moving away from the Mars Odyssey spacecraft design to one based on the successful Mars Reconnaissance Orbiter mission. This basic design has served the planetary science community well. 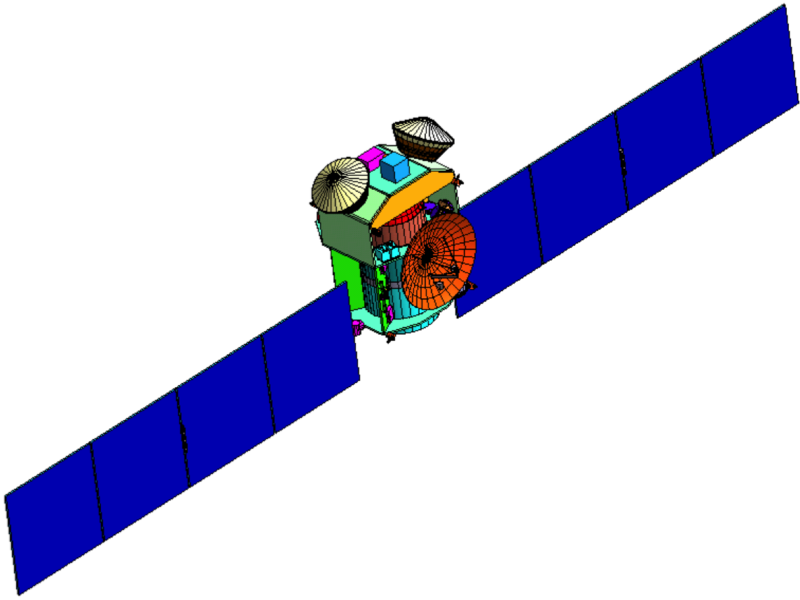 In addition to MRO – Juno, MAVEN, and now OSIRIS-REx are based on this basic spacecraft configuration. Two major changes are obvious in the spacecraft design based on this decision – the high-gain antenna grew from 1.3 meters to 2 meters and the solar arrays went from four panels to two panels while still providing ample power for mission operations. After entering the New Frontiers competition, the OSIRIS-REx spacecraft reached a relatively stable configuration. Throughout 2008 and 2009 the OSIRIS-REx team worked first on the Step-1 New Frontiers proposal and, after making it through another down select, the New Frontiers Concept Study report. Throughout this period of intense design activity, the spacecraft went through many design changes. However, the overall structure of an MRO bus, two-axis gimbaled solar arrays, and a two-meter high-gain antenna remained fixed. 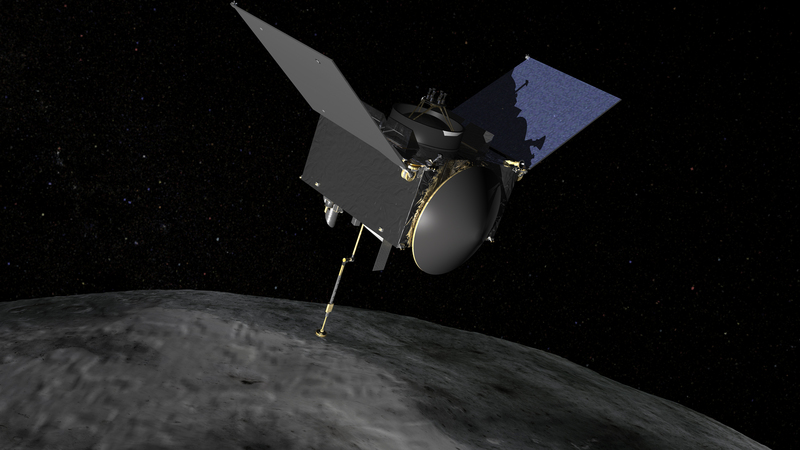 As far as the artists were concerned, OSIRIS-REx did not change at all. One aspect that changed across the various representations of the spacecraft was the configuration of the solar arrays. The two-axis gimbals give us a wide range of motion and the artists often took liberty with this freedom. In one early draft of our mission logo, shown below, the arrays are gimbaled into a position that is impossible to achieve. Despite correcting this error quickly, this erroneous configuration persists on the internet and still shows up in our documents from time to time. Sometimes the artists get it wrong. 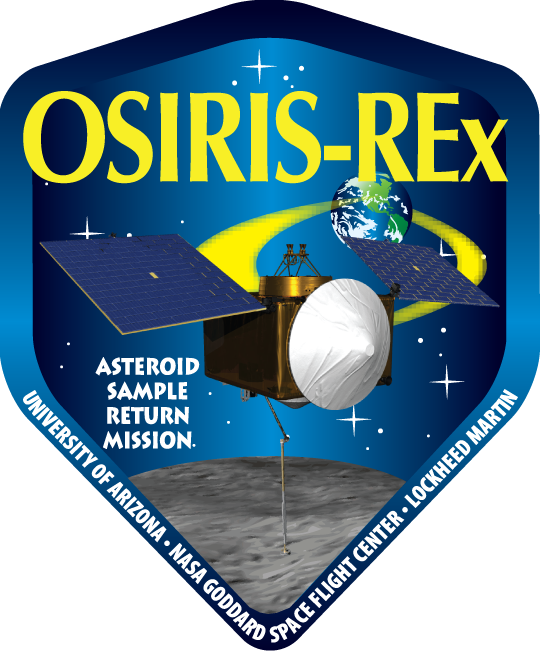 This version of the OSIRIS-REx logo shows the solar arrays gimbaled into an impossible configuration. As we moved past the proposal phase and into detailed spacecraft design, the last couple of modifications settled in. What seemed like a minor design change, changing the protective mylar blanketing material from gold to germanium, had a striking effect on the spacecraft appearance. Instead of the bright yellow spacecraft that had been our hallmark, OSIRIS-REx is now sporting a classic battle-ship grey color pallet. Even though the design of the solar arrays has not changed substantially, we have gotten a little smarter about their positioning during the critical touch-and-go sample acquisition phase of the mission. We now expect to gimbal the arrays back into the “Y” configuration shown below, to minimize their exposure to any backscattered regolith that may be launched at the spacecraft during sampling. 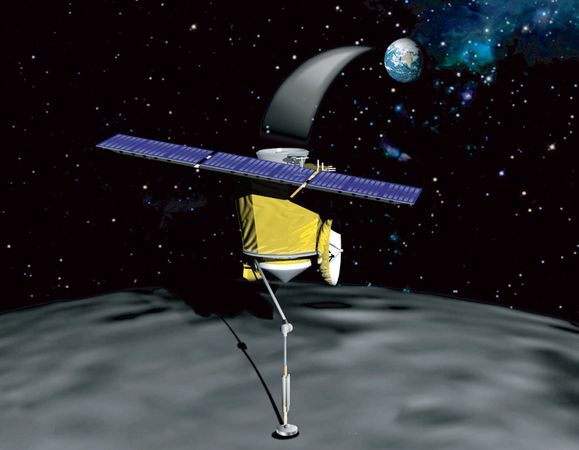 Will the spacecraft really look like this in 2019 when we descend towards the surface of Bennu to collect our sample? Only time will tell. . . This configuration reflects the latest OSIRIS-REx design, sporting germanium kapton mylar, two-axis gimbaled solar arrays, a two-meter high-gain antenna, and an externally mounted TAGSAM.